Your one stop for Squirrel Education! "Loving people, one squirrel at a time! " 1 Corinthians 13:13(NIV) And now these three remain: faith, hope and love. But the greatest of these is love. Help! I found a baby squirrel, what do I do? We offer free advice for all aspects of squirrel care, and believe it or not, we will answer your questions and e-mails when you write! We love to hear your stories, but please keep your questions short so we can get right to your answer quickly, because we are swamped with mail all the time. Be sure to check our BLOG for answers! NEW-NEW-NEW! All of our Squirrel Nutrition Products are now available in Bulk! Because it saves time and packaging, we are offering $1.00 off the cost on a per kit basis, PLUS, we are giving FREE Priority Shipping on all bulk orders of 4 to 7 kits! Get the details HERE! Mr. Twister is a beautiful little Red Squirrel whose mother was a victim of the tornado that ripped through Northern Ohio this past summer. It touched down about 5 miles North of where we live and involved the property of a friend of ours, Mr. Twister was found roaming around in their garage looking for something to eat. He was in a starvation situation and he had pneumonia.About a week after we took him in his hair started to fall out. He was quite naked for the better part of a month. We started working on his nutrition status by giving him plenty of high fat formula and continued it on after he weaned by feeding him avocado. As you can see, his hair has grown in quite beautifully and he has captured the heart of my wife, Paula! He's very friendly but quite high-strung and high energy. He gets quite nervous and scared around strangers, which is unfortunate because we would love to take him with us when we give squirrel talks! How a dead frozen squirrel changed my life forever! Hi! My name is William Sells. I am owner and operator of SquirrelNutrition.com and Squirrel Haven Rescue. 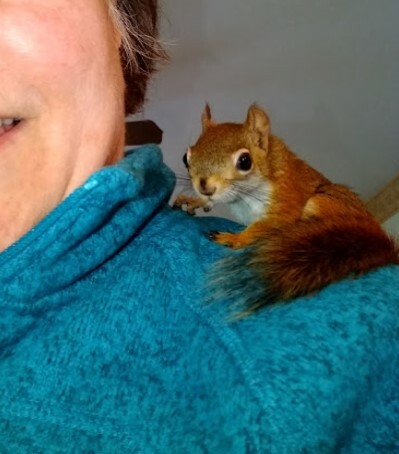 At the age of 60, I had never seen nor held a baby squirrel until March 17, 2008 when a band of crows looking for a quick meal literally dropped one into my life. I had just gotten up after working a Night Shift in our local Emergency Room, when I viewed a curious sight from my upstairs bathroom. I observed 3 crows standing around my utility trailer. Suddenly, a squirrel emerged from under the trailer and chased after one of the crows. It flew up into my Oak tree, then swooped down and landed on the edge of the trailer. I watched as it hopped down into the trailer, pick something up, and flew off. From it's beak I saw tiny legs and a tail dangling and I immediately knew I was watching one of natures cruel realities. The crows had tore into a leaf nest of a mother squirrel in an attempt to seize and eat her babies. I came downstairs and related what I saw to my wife and wondered out loud if the baby had left an impression in the snow. My wife volunteered to go out and investigate, and when she returned she confirmed that there was indeed an impression in the snow, plus there was another naked body laying beside the impression. I quickly put on my shoes and went out to investigate for myself. 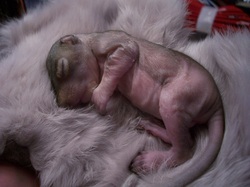 I gently picked up the half frozen newborn squirrel to take a closer look. It was dusky blue, stiff and not breathing, so I assumed it to be dead. I took it in to show my wife before taking it out to bury. As we sat and talked about what had just transpired, the thought came to me that whenever someone is brought to the Emergency Room after drowning in cold water, we always continue CPR for a longer period of time, while rapidly warming the body. I asked my wife, "Why don't we give it a try?" She went and placed a rice bag in the microwave while I started pumping on the tiny squirrel's chest with one finger and blew tiny puffs of air into it's nose. We placed it in a tanned rabbit skin, then wrapped the warm rice bag around it while I continued CPR. After a 10 minute cycle of CPR and warming the tiny creature started to move and breathe on it's own. It was at that point I felt a wave of emotion and bonded with this tiny being on a level that is totally beyond explanation. As crazy as it sounds, I suddenly realized that I had found my passion. For the past 9 years I've studied everything I could about squirrels and their care. And while there are many books that talk about observed squirrel behavior, characteristics, and care through the first 12 to 14 weeks of their lives, there's very little information that takes you beyond that age! I named my squirrel Lucky, because she is a miracle, and she is very lucky to be alive. But, I have to admit that beyond the books and study,Lucky has been my best teacher, and has taught me many lessons that are not contained within the pages of any book! I have nearly lost her three times in the seven years she has been with me. But, it has been my experience that every time she has gone through a life threatening crisis, and we figured out how to bring her through it, someone writes and asks me about the same crisis their squirrel is going through. Then, it became clear to me that Lucky went through problems so that I could learn and help others with the same problems. It's my belief that she was no accident. I believe that she was a gift from God to show me my real passion! I will do anything to help a squirrel in need or a person who is trying to help a squirrel. God created animals before He created man, so that tells me that He really cares about them! He has given me the passion for squirrels and has graciously allowed me to have this labor of love, both for the squirrels and the people who are destined to adopt them into their family! This story actually started 5 months before we found Lucky. At that time, my wife was a member of Curves for Women and would walk to the facility several days a week to work- out. As she would walk, she would use the time to carry on conversational prayer with God. On that particular day, she observed two squirrels playing in the fallen leaves and she related this thought to God, "I've always wondered what it would be like to have a squirrel sit on my shoulder and be able to interact with it! Someday, either here on earth or in heaven, I would really like to know what that would be like!" Lucky was the answer to that prayer! Since September of 2008 that prayer has been answered over 50 times! That is the present number of orphaned squirrels we have rehabbed and released as of this date of December 31, 2017. Remember: Nut Squares are mainly for Captive Squirrels. Squirrel Biscuits are a means of getting more vegetables into the diet of wild squirrels. Lucky the Squirrel our 10 year old blind squirrel on her 10th Birthday , March 7, 2018. Still going strong due to proper nutrition and completely natural healthcare!